The Virtual Assistant Industry is one of the fastest growing industries out there for those looking to work from home. It’s one of the few businesses you can start with little to no money. Some sources say that there are over 25,000 Virtual Assistants out there. If you’re interested in starting your VA business, here is a checklist to get you started. ð Do Your Research. One of the first things any prospective Virtual Assistant must do is research the virtual assistance industry. Check out some virtual assistant forums and websites. 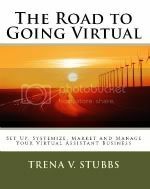 We’ve seen all too many times individuals back out when they realize the amount of work that is required to be a Virtual Assistant. ð Determine Your Niche. This is the time for you to be very realistic with yourself. Make a list of all the skills that you’ve acquired and which ones you love to do. It’s easier to start with something you enjoy doing. ð Create a Business Plan. Every new business needs a business plan. Not having one is like going on a road trip with no map, you want to make the process as smooth as possible. It doesn’t have to be long or complicated. It simply needs to be a list of your short-term goals, start up costs and a plan as to how you will initially finance your business. ð Develop Your Business Policies. Do you want your business to be full-time or part-time? What type of communication will be available for your clients or prospects (phone, fax, email, instant messaging, etc)? What type of contracts do you want to use? What holidays will be reserved? What type of payment will be accepted? ← Can I Add Networking Contacts to My Email List?